Artichokes can be a pretty scary looking thing to eat if you have never had the pleasure. They spark curiosity at first sight. If you want to know how to properly prepare , here is a simple way of going about it. It really isn’t complicated and eating them is worth the effort. I hope you enjoy you. Read on for more information. Look at the artichoke. If you find thorns on the tips of the leaves remove them with a knife or shears. These thorns are actually edible and are soft after cooking. However, they don’t look to appetizing on the plate. Cut approximately ¾ inch to 1 inch off the top of the artichoke. Remove the tiny leaves from the bottom and stem. Slice off the stem leaving an inch. Or you can remove the stems and outside layer. Run water over artichokes to remove any debris. Place them a large steaming basket. Add water to the large pot. It has to be enough water to completely cover the artichokes. Add some flavoring to the pot. You will need a whole glove of garlic (or more if you like), a cut up piece of lemon, and a whole bay leaf. The bay leaf is really the star of flavor in this recipe. Submerge the artichokes in the water. Allow them to come to a boil over medium heat. Lower the heat to a simmer after it begins to boil. Cook on low for about 25 to 45 minutes. You should be able to remove the leaves with ease. The bigger the artichoke, the more time it needs to soften. 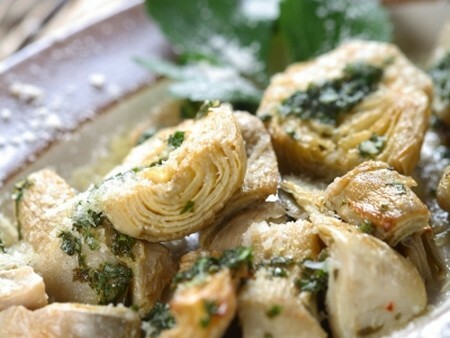 Artichokes can be eaten hot and cold. Whatever your preference, you can accompany the artichokes with a dip. It’s simple to make. Combine a little mayonnaise with balsamic vinegar for one option. Another option would be to melt some butter and use it as a dipping sauce. Remove the outer petals of the artichoke. Dip the white end of the artichoke into the mayonnaise sauce or the melted butter. Put the leaf in your mouth with the dip first. Clamp your teeth onto the petal. Pull the leaf of the artichoke through your teeth. This removes the soft part. Throw the outside away. Repeat with all the rest of the petals. 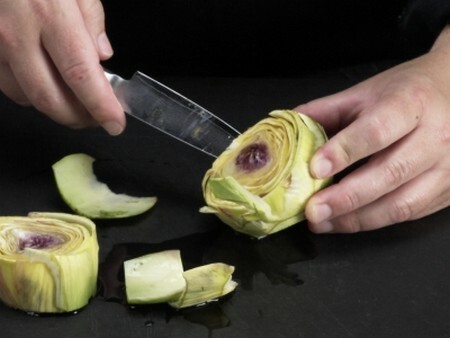 Use a spoon (or knife) to remove and throw away the fuzzy looking part f the artichoke. This is the choke part. It covers the heart of the artichoke. The lower part left is the heart. You can dice this into parts and dip into the butter or mayonnaise sauce as well.